The anticipated Adapted Equipment Loan Program is ready to get started! Multiple barriers can stand in the way of fitness and leisure for persons with disabilities. One such barrier is access to specialized equipment that will meet their needs. Not only is the equipment specialized, it’s expensive. This program hopes to decrease barriers to participation in sport and recreation by offering free equipment that will open up opportunities for physical activity. We hope this will be the beginning of many supports we can bring to this population. Cumberland County has TWO of these PFD-A lifejackets available for use. They are being housed at the YMCA and are available for use there, or for loan. Both jackets will accommodate users from 90-190lbs (large). They are intended to help people with lying on their back (floating horizontally). 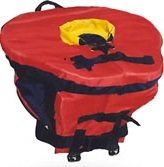 Regular PFDs would allow someone to float, but these PFDs provide extra head support, so that when floating the head does not dip into the water. This lifejacket supports the upright position for those with limited to no core strength, balance and/or trunk control. It allows the user to float vertically in the water and experience the water in a different way than in a regular PFD. Cumberland County has FIVE of these Lj-A jackets available for use. They are being housed at the YMCA and are available for use there, or for loan. They are in varying sizes, accommodating users from 30lbs – 250lbs. Swimming is the sporting discipline most practiced by individuals with mobility issues since it allows the individual to use their motor abilities in a weightless situation. 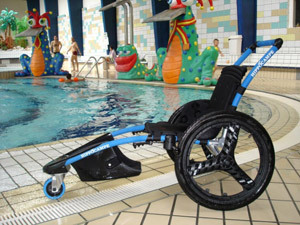 With the Pool Hippocampe, individuals can move freely about the pool without using their standard wheelchair or getting it wet, avoiding hygiene problems relating to having outside wheelchairs near pools. The YMCA received the funding for this through our joint efforts, and it will remain as a YMCA pool wheelchair, and not be available for loan, though it will be available for use for anyone visiting the YMCA. This bike is built for people up to 225 lbs. There is a lap belt and a torso belt as well for trunk support. The seat and handlebars are adjustable to various heights and comfort levels. This bike is designed for individuals with limited to no mobility, balance issues, as well as for those who feel more comfortable on something more stable than a two wheeled bicycle. A steering handle is on the rear (optional use), and it functions very easily. The bicycle has direct drive, so the pedals turn and the person in the seat gets a workout no matter what. This beauty is called the Terrier Trike. This rugged bike is made for children from the age of 4 ½ years. This bicycle has adjustable back/trunk support, it has foot sandals with a pulley system, and a lap belt. It also has a rear steering system, which is optional depending on the level of ability the child has. 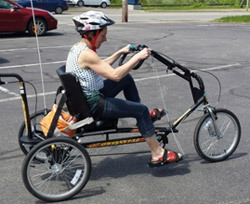 This bicycle would also be intended for those with limited to no mobility, as well as those with balance issues, and possibly even some sensory issues. 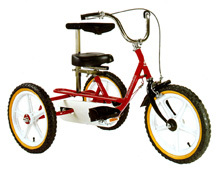 This bicycle is suitable for children with a max weight of 100 lbs. It is currently being held at the Cumberland YMCA for use with the S.M.I.L.E. Program, but is available for loan, as well. Sledge Hockey is an exciting, fast-paced game played by ath­letes of all abilities, with and without disabilities. Although it was designed for players with lower body disabilities, it is a popular parasport for all, and for fans too! Nearly all of the rules follow traditional ice hockey, with the use of pucks, sticks and nets on an ice surface. Sledge hockey players use lightweight aluminum “sleds”, with two skate blades attached to the underside. Players maintain their balance and turn using their hips. Players use two hockey sticks instead of just one. The sticks are shorter than traditional sticks and have “a blade on one end and a pick on the other.” This pick is what a player will use to maneuver across the ice, in a motion similar to cross country skiing. The sledges that we have for loan are easy to use and adjust. Lap straps keep the player secure in the sled, and high backs make for a comfortable ride. We try to keep these spread among the arenas in the county, so feel free to ask when you go for a skate to try one out. It is possible that all sledges are at one arena, however, so it would be great to call ahead. You can even book all six sledges! We have wheel kits for off season or gym use, as well. And boy…are they fun!! This Loan program is a new initiative for individuals with disabilities and their families. Families, schools, and community groups have the opportunity to try a variety of equipment to experience new leisure pursuits. 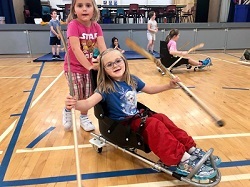 For more information about the Municipality of the County of Cumberland's Adapted Equipment Loan program please contact Vicki Weaver, Recreation and Physical Activities Coordinator.